Welcome to our COINiD article series! For some weeks we will post informative pieces on the features in our wallet including our personal thoughts on crypto storage and the ideas behind the development of the app. For some features you will also find some brief guides on installment and usage. If you have any further questions, do not hesitate to contact us! In this first piece, we will discuss our most prominent feature; our cold storage solution. When developing our COINiD Wallet, we knew that we wanted one of our outstanding features to be that of cold storage. A mobile hot wallet is very convenient since you always have access to your funds, but with a lot of coins and with no third party as security, you might not want large amounts of funds exposed to an online environment. That all we knew, so what were the existing opportunities for cold storage in mobile wallets? For many successful mobile wallets that were on the market, the most common option for cold storage was their own specialized hardware wallets. However, these are generally rather pricey, and you should be prepared to pay from 50 up to a couple of hundred dollars for the hardware needed. 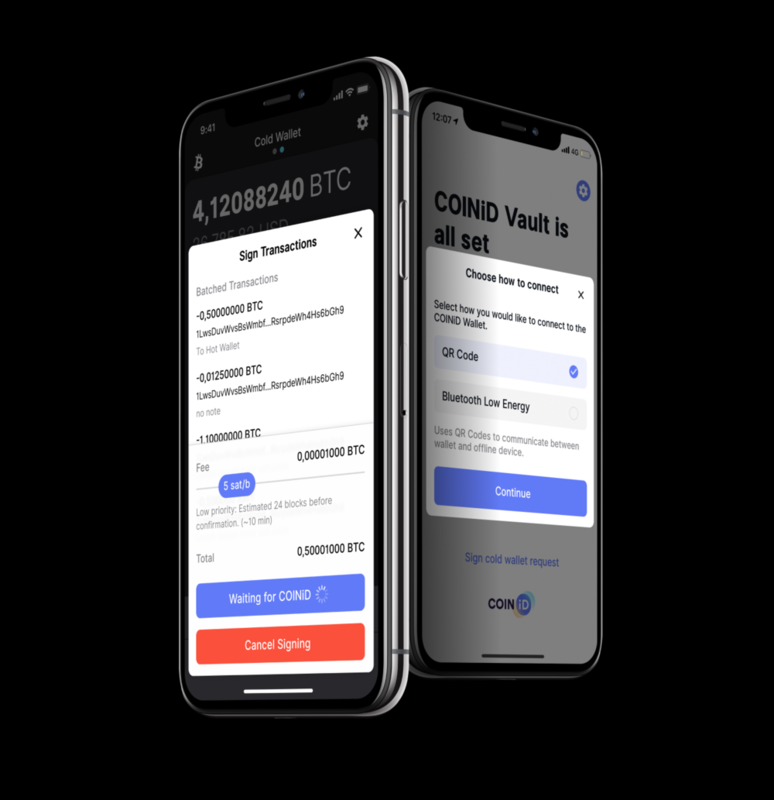 Download the COINiD Vault on a separate mobile device to create cold storage for your coins. So we asked ourselves; can we create a wallet that offers cold storage without making our users spend a lot of money on specialized hardware? Can we make a wallet for everyone? This was our solution: With smartphones being continuously renewed and, hence, more disposable, most people that we know have at least one old smartphone laying around the house without being used. Why not use these as hardware where you can store your funds offline? As long as the device is kept offline, it has the same purpose and principle as specialized hardware for cold storage, except you do not need to spend a lot of extra money. Remove your SIM-Card, reset your WIFI-settings, turn on Bluetooth, disable WIFI and set the phone in Airplane Mode. The COINiD Vault lets you protect your funds in an offline environment. 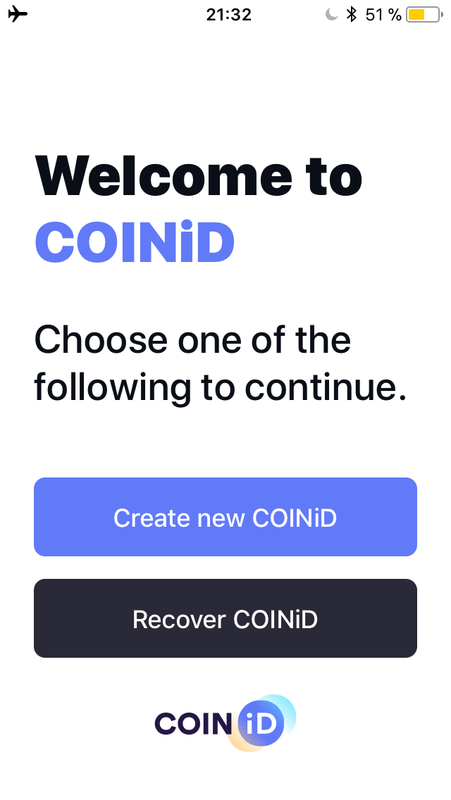 Open up the COINiD Vault and create a new COINiD. Write down the 12-word recovery phrase that you are given. Create a new 6-digit pin. Now your vault is ready to sign requests. Download and open up the COINiD Wallet on your online device and press “Create cold wallet with COINID” which will give you a 6-digit code. Go back to your COINiD Vault and press “Sign cold wallet request” and enter the code you received from the wallet, then sign again with your personal PIN. Follow the steps to successfully set up your cold wallet. Now your COINiD Vault and COINiD Wallet are connected and you have yourself a cold storage. Even though your hot wallet is online, the cold wallet will always be offline as the COINiD Vault does not need Internet to sign transactions. Instead, we added the option to either sign with QR-codes or Bluetooth - whatever you personally prefer. Transfer funds to your cold wallet and sleep well at night. Easy and secure, that is what we want the COINiD experience to be. Our users should be able to store their funds offline and sleep well at night, knowing that their funds will not be compromised or exposed to any kind of online environment.